Leaders of Resist from Day One Coalition announce plans for massive Twin Cities May Day march | Fight Back! 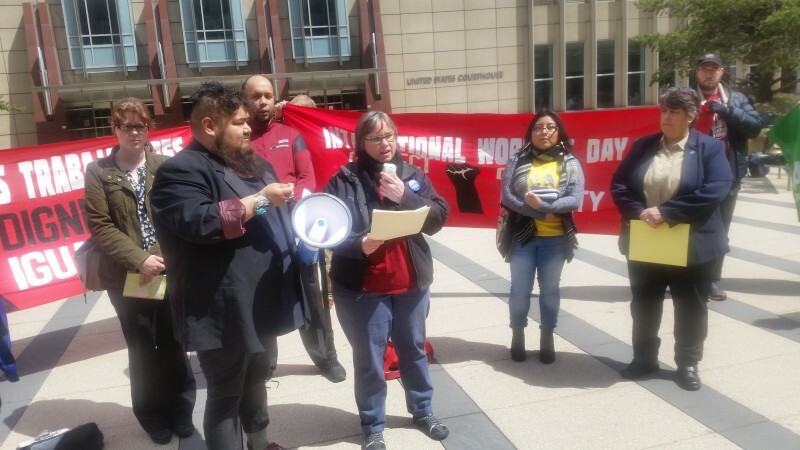 Minneapolis, MN – At a press conference, April 28, leaders of the Resist from Day One Coalition, announced plans for May 1 rallies and strikes converging in unified march in Minneapolis on ‘Day without Immigrants’ for immigrant and workers' rights. The march on May 1 will begin with a rally in East Phillips Park, located at 24th Street and Cedar Avenue in Minneapolis, from 3:00 - 4:30 p.m. that will include speakers and live music. At 4:30 p.m. the march will leave the park. Three other feeder marches, of students, anti-war forces and teachers will merge with the main march at different points, and the march will culminate at the downtown Minneapolis Federal Building, where there will be a final rally at 6:30 p.m. The May 1 march is endorsed by 15 Now - MN, 320 Members First, AFSCME Local 34, AFSCME Local 2822, AFSCME Local 3800, Al Madinah Cultural Center - UMN, American Muslims for Palestine, Anti-War Committee, Asamblea de Derechos Civiles, Casket Arts resource group, Center for Immigrant Justice, Centro de Trabajadores Unidos en Lucha (CTUL), Communities United Against Police Brutality, Cosecha - MN, DeLeon & Nestor, LLC, Democratic Socialists of America - UMN, East Side Freedom Library, Feminist Student Activist Collective - UMN, Filipinos for Immigrant Rights in MN (FIRM), Freedom Road Socialist Organization, Indivisible North Metro, Indivisible Resistance Eagan Burnsville (IREb), Indivisible Saint Paul, Interfaith Coalition on Immigration (ICOM), InquilinXs UnidXs por Justicia, ISAIAH, IWW General Defence Committee Local 14, James Dewitt Yancey Foundation MN Chapter, Mayday Books, Med Students for Choice - UMN, Minneapolis Regional Labor Federation, Minnesota Immigrant Rights Action Committee (MIRAC), MIRAC-UMN, Minnesota Peace Action Coalition, Navigate, Queer Devil Worshippers for A Better Future, RiseUpTimes.org, Saint Paul Federation of Teachers, Saint Paul Regional Labor Federation, SEIU Local 26, Sierra Club North Star Chapter, Students for a Democratic Society UMN Twin Cities, Students for a Democratic Society - UMN Morris, Students for Justice in Palestine - UMN, Twin Cities Coalition for Justice 4 Jamar, Twin Cities Democratic Socialists of America, Twin Cities Peace Campaign, Universal Movement for the Advancement of Hip Hop (UMAHH), Voices for Racial Justice, VoteClimate.org, Welfare Rights Committee, Women Against Military Madness (WAMM), Young People's Action Coalition.